In hot, dry weather, hedgehogs will appreciate a dish of fresh water. The west European hedgehog (Erinaceus europaeus) is Britain’s only spiny mammal,with over 6000 creamy-brown spines in their coat. If threatened, they curl into a tight ball of spines, by contracting the large circular orbicularis muscle. Hedgehogs can stay like this for many hours, safe from most predators. In rural areas, they live along woodland edges and hedges (hence the name!) In urban areas, compost heaps and flowerbeds, and short grass in lawns or parkland are used to forage for ground-dwelling invertebrates, mostly worms, snails, slugs and beetles. Hedgehogs are mostly nocturnal and travel 1-2 km in a night. From November until the end of March, when food is scarce, hedgehogs hibernate to conserve energy. Litters of up to 7 hoglets are born from May onwards and are weaned between 4 and 6 weeks, weighing about 120g (typical summer weight for an adult is 800g.) Hoglets born later in the year can’t always put on enough weight to survive hibernation. 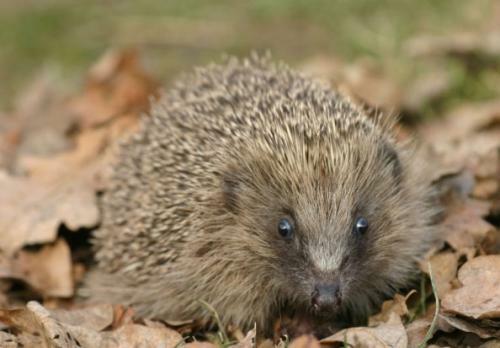 We all love to see hedgehogs bumbling around shortsightedly, but they are in serious decline. People often say that they used to see hedgehogs but they don’t any more. Can you help us find out how many there are in and around the Park? Take part in our hedgehog survey: if you live close to the Park and you see a hedgehog (or their droppings) in your garden or in the Park, download the Guidance Notes and Survey Form. There are other ways to help hedgehogs, by making some small changes in the way we manage our gardens, we could make a difference! Hedgehogs might want to come into your garden, but they can’t get in! If you have a close-boarded fence or a garden wall, make a 15cm square hole so they can pass through. Try to keep part of your garden wild, to encourage invertebrates. Avoid garden chemicals, slug pellets and non-environmentally friendly wood preservers if possible. Be careful with garden or sports netting: hedgehogs (and birds) get entangled. Never give hedgehogs bread and milk: it upsets their stomachs. Use meat cat food if you want to feed them.